When this post goes live it will be my birthday. This year's birthday is a extra special because it's the last one of my 30's. When I think about that, I sigh a little. I know it's cliché, but where did the time go? I am not so sure...but I do know I plan to make the most of 39. Then next year at this time, we'll see how well I'm embracing the reality of 40. Long sigh. I have a feeling I might go into it kicking and screaming just a little bit. 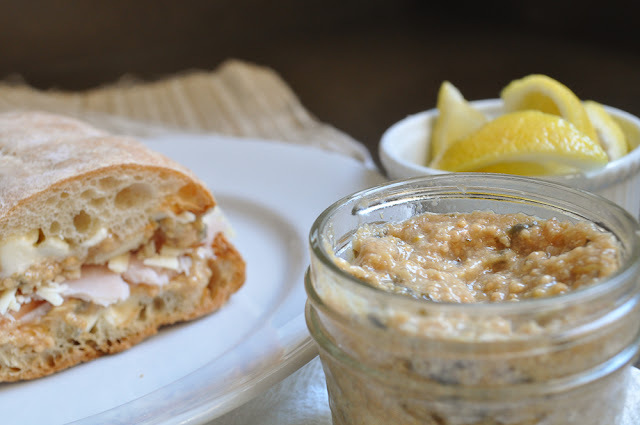 I didn't necessarily plan a specific post to coincide with my birthday, and it just so happens this lemon-sage wine mustard is up next on the blog roster. But I'm more than happy to celebrate with mustard! I LOVE mustard! It's high up on my list of preferred and necessary condiments. My family thinks I'm a little crazy about mustard in fact. When I eat a hot dog for instance, the ratio of mustard to dog is about 50/50. Yeah. Really. I guess my family has a point and it might be a smidge overboard. What can I say? I just cannot seem to get too much mustard on a hot dog. And I like it all. Yellow. Dijon. Grain. Brown. Honey. Spicy. I love the acidity and tang from mustard. Yum. When Hima of All Four Burners challenged us to use citrus in our monthly Can It Up project, I started looking for recipes. I came across this lemon-sage wine mustard in my Ball Complete Book of Home Preserving. I thought it would be kind of cool to make homemade mustard. Plus I've only canned sweet things to date....jams, fruit butters, preserves, so this seemed like the perfect opportunity to combine my love of canning with my love of mustard. That sounds silly as I read it back. But it really was fun to make and I enjoyed the final product. The mustard is really very lemony. The sage is subtle and the wine sings a nice little melody in the background. Since the lemon is prominent, I've found I've enjoyed this accompanied with a little mayo too to balance it out. At least on sandwiches. 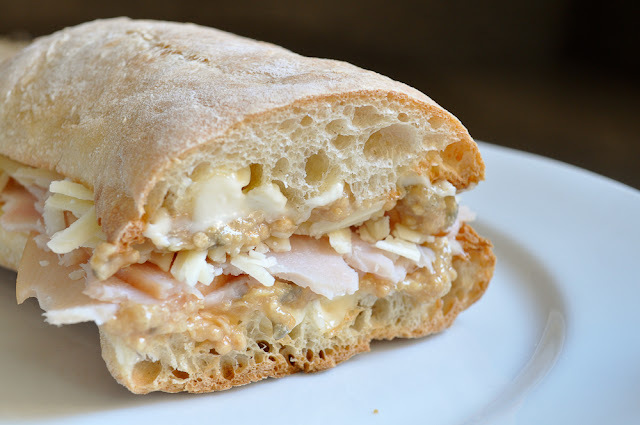 The sandwich pictured below is homemade ciabatta bread (courtesy of Hubby), turkey, grated sharp white cheddar cheese, mayo and lemon-sage wine mustard. Delicious! Mustard is surprisingly easy to make. The hardest part was finding the main ingredient. Whole mustard seeds. My first stop was Whole Foods. They sold it. In incredibly tiny portions. My mustard would have cost a small fortune. I know a lot of people love Whole Foods, but I really don't seem to have the best luck there. Next I tried Sprouts (another local health food grocery store). What's great about Sprouts is they sell spices in bulk bins/jars where you can fill up a bag with as much or as little as you want. I've purchased many spices this way especially when I am using something new for a recipe and I don't know if I want to invest in a whole jar. I was thrilled to see Sprouts had a huge container of mustard seeds. I was able to eyeball a 3/4 cup portion and it cost right around $5 dollars. Once I secured all my ingredients it was smooth sailing. The mustard seeds get soaked in a sage steeped wine for a couple of hours. The seeds soak up all the liquid from the wine and get transferred to a food processor along with white wine vinegar. Several long pulses in the food processor allow the seeds to break down, but some grain is left. It's nice to have a little texture from the seeds in the finished product. The mustard goes into a pot on the stove to cook along with the lemon, sage, honey and salt and, then into prepared canning jars to be processed in boiling water. You'll notice this mustard doesn't have a bright yellow color. I had always assumed the mustard seed is where the color came in. But I learned that it actually comes from one of the spices in yellow mustard, turmeric. Since this mustard is turmeric free it has a much more muted yellow, almost pale brown color. Don't let the color fool you, this mustard has quite a zing! It's great on sandwiches. And I envision it accompanying homemade pretzels, grilled bratwurst or hot dogs or a honey baked ham. Finely chop enough sage leaves to measure 1/3 cup and set aside. Coarsely chop remaining sage leaves and stems to measure 1/2 cup and place in a small stainless steel saucepan with the white wine. Bring to a boil over medium heat, while stirring and pressing on the sage to release as much flavor as possible. Remove the pan from the heat and cover. Allow to steep for 5 minutes. Using a fine mesh strainer or sieve, drain the safe infused wine into a bowl while pressing down on the sage to remove as much liquid as possible. Discard the sage and return the wine to the saucepan. Add the mustard seeds to the wine and cover with a lid. Allow to sit at room temperature for about 2 hours or until the mustard seeds have absorbed most of the moisture. Prepare your lids and jars by washing in hot soapy water. Place jars in a water canner, ensuring jars are covered with water and bring to a boil. Place lids in a small sauce pan over low heat. Set screw rings aside. Transfer wine soaked mustard seeds to a food processor or blender, including an residual liquid. Add vinegar and process until the mustard seeds are well chopped but still has a slightly grainy texture. Transfer the mixture to a stainless steel medium-large size saucepan. Add lemon juice, zest, honey, salt and the 1/3 cup of finely chopped sage. Turn heat to high and boil, stirring continuously. Once boiling, reduce heat to low and allow to gently boil, stirring often. Allow mustard to reduce by 1/3 of it's volume, about 20 minutes (note--mine only took 10 minutes). The book cautions from allowing the mustard to get too thick as it can prohibit proper heat penetration during canning process. Remove one jar at time from the canner using tongs, discarding the water and hold with a doubled up clean kitchen towel. Ladle hot mustard into hot jars leaving 1/4 head space at the top. Remove air bubbles by using a thin chopstick around the mustard. Wipe any residue off the rim. Place a hot lid on top and secure using a screw band until resistance is met and turning until fingertip tight (do not over tighten). Repeat until all the jars are filled. Place prepared jars in canner. Allow the water level to sit at least 1 full inch above the jars. Bring to boil. Process for 10 minutes with lid on the canner. Once they've boiled for 10 minutes, remove the canner lid and wait 5 minutes. Remove jars from canner and cool on a kitchen towel, undisturbed for 24 hours. Happy Birthday!!! enjoy your 39th year :)) and what a great way to celebrate with this delicious mustard - LOVELY!! Happy Birthday, Best Friend. I will be calling later today to sing to you (after coffee). This looks ridiculously yummy! This is totally my kind of sandwich. I wish I was having this for lunch today. This will be a must-do soon. XOXOXOX Enjoy your day, mama! ...And speaking of mustard I just remembered that time in high school when we went to Subway and I was shocked to see you had mustard all over your meatball sub.. it looked gross and I couldn't fathom it...until I had a bite and realized it wasn't crazy...it was GOOD. To this day, I have never seen anyone else do that. OMG...you've just officially publically confirmed my craziness for mustard! I so cracked up when I read this comment. Haha! Happy happy birthday Gloria!! I absolutely love your plans, you can never have too many birthday dinners :) I'm not a huge mustard person (I mostly use it in sauces/dressings) but Shane is a big fan. I'll have to try this for him one day soon! PS - Been loving your pins lately. My time to pin has been limited, but I like to sneak a peek at the front page when I can. Thanks Tracey! The birthday dinners have started with a bang! I've totally caught the Pinterest bug! I feel like I'm playing catch up. And loving every minute. Thank you for sharing this recipe! I know your readers are quite happy to see this post. The rich flavor of the mustard intensified by the wine, lemonade, and sage is really delicious. It makes me want to order one bite of it! Why don’t you write about another recipe with rum next time?